Iconoclast designer Elsa Schiaparelli is most remembered for infusing a sense of wit and irony into her designs through surreal touches. Schiaparelli’s Fall 1939 music-themed collection celebrated music, quite literally, with drum-shaped button closures, embroidered musical notes and music boxes designed into belts and hats. This particular dress, owned by heiress Millicent Rogers and housed at the Costume Institute at the Met, features musical notes and symbols embroidered in metallic thread on organza, paired with a belt designed with a working music box as the buckle. 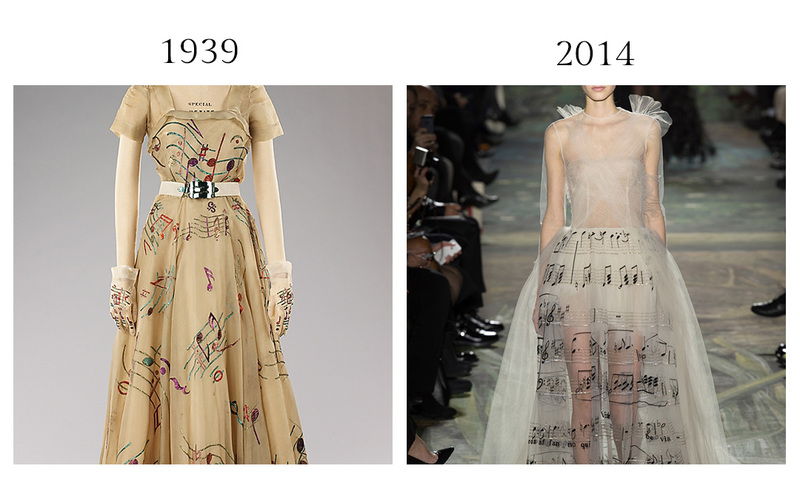 At Valentino, designers Maria Grazia Chiuri and Pierpaolo Piccioli would similarly transform textile to sheet music for the brand’s Spring 2014 Couture show.